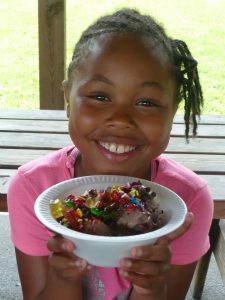 On July 18th, DaVita Dialysis came up to Camp Kelly to treat the children of Project Hope to scoops and scoops of ice cream smothered in chocolate or strawberry sauce and topped with gummy bears, M&M’s and chocolate sprinkles! It was an idea of DaVita Dialysis, as a way to give back to the community and they brought a team of employees, some traveling over two hours to get to camp. Thank you, DaVita Dialysis and thank you from the 375 very happy campers!